In a new report, Highway Boondoggles 2, U.S. PIRG and the Frontier Group profile the most wasteful highway projects that state DOTs are building. Today we highlight the proposed 30-mile extension of State Highway 249 in Texas, which the state DOT wants to gouge through communities that already suffer from too much air pollution. 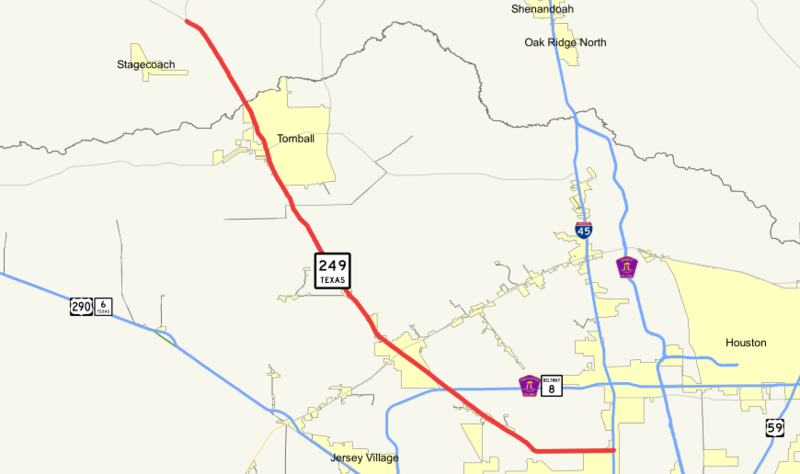 Citing outdated traffic projections, the Texas Department of Transportation claims it needs to spend between $337 million and $389 million building a 30-mile six-lane highway from Pinehurst in Montgomery County through Todd Mission in Grimes County to College Station. Having in April 2015 opened a $335 million, six-lane, six-mile tolled expansion of State Highway 249 from the Sam Houston Parkway to Tomball in Harris County, the Texas Department of Transportation is working to extend the highway another 30 miles, all the way to College Station, home to Texas A&M University. The project is proposed in two phases, first connecting Pinehurst to Todd Mission and then reaching to Navasota, a suburb of College Station. The first phase — which, if approved, could see work begin in 2016 — would run through an area that is already suffering from ozone air pollution, to which vehicle traffic is a major contributor. In May 2015, TxDOT began searching for a private company to build the second phase of the highway, despite objections from residents who said it would displace farms and ruin the rural character of the communities it would pass through. They also complained that TxDOT had promised local governments additional transportation funding, which they said changed the views of local officials who had originally opposed the project. In making the decision, state officials paid lip service to “demand for more travel options” besides highways, according to a Houston Chronicle account of the meeting. No element of the highway extensions include any elements of public transit or other methods aimed at reducing Texans’ need to drive. The project documents cite population growth and prospective sprawling development as reasons the road may be needed, but they use outdated driving projections that do not reflect current travel trends in the area. TxDOT expects vehicle traffic on one road in the area to quadruple from 2015 to 2040. State traffic projections represent average annual growth rates of between 3.7 and 5.5 percent. But data at TxDOT traffic counters in the area show that from 2007 to 2013, the growth was far lower, between zero and 4 percent a year. As someone who lives in Bryan/College Station, I really wish that the state would have looked into options like building a rail bypass for Union Pacific to avoid our town, so that we could use the existing rail line for transportation to Houston. The old location of the station by the college (which the town was named after) is right next to the football stadium, which was recently expanded to hold about 100,000 people. Just running a train twice a week before and after games during football season would probably do just as much to ease congestion as an entire new highway – especially since it’s got tolls, and many people in Texas will definitely go an hour out of their way to sit in congestion on the old highway rather than paying the toll on the new one. The rail line also goes right through the heart of our historic downtown in Bryan – it would benefit the local community to not have freight (including many tanker cars of oil) going right through the middle, and might even allow a local rail service connecting downtown to the university.